Chris Voigt is the executive director of the Washington State Potato Commission. In an effort to educate the public about the nutritional value of potatoes, he ate 20 potatoes a day, for 60 days straight. That’s right, his diet consisted of only potatoes and nothing else. No toppings, no chili, no sour cream, no cheese, no gravy – just potatoes and maybe some seasonings or herbs and a little oil for some of the cooking. Chris’s diet started on October 1, 2010 and ended November 29, 2010. His mission was to show the world that the potato is so healthy that you could live off them alone for an extended period of time without any negative impact to your health. Of course, those of us involved in the science and practice of healthy living were curious what impact this would have on his health and well-being. We all know how potatoes have received a lot of bad press over the last few years. They’ve been said to be high in the glycemic index, will raise your blood sugar, increase your risk for diabetes, raise your triglycerides and increase your risk for heart disease and even possibly some cancers. For the record, his goal was not to lose weight but to consume enough calories (2,200) to maintain his weight – which is the equivalent of 20 average potatoes a day. As we can see, even though Chris was not attempting to lose weight, he did; but more importantly he had highly significant reductions in his cholesterol, triglycerides, LDL, glucose, TC/HDL ratio, LDL/HDL ratio. These numbers indicate that Chris dramatically reduced his risk for heart disease and diabetes. The improvements were in fact greater than what we see from drugs and many intensive lifestyle programs. And he did it all in 60 days! 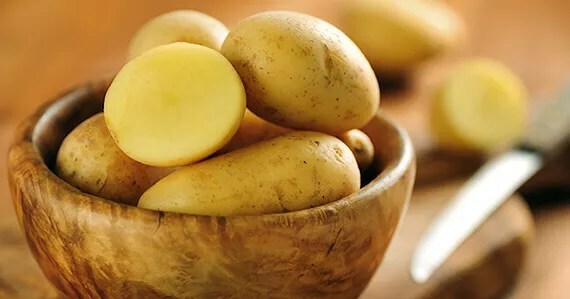 While I would not recommend an all potato diet for the long-term for anyone, all of this points to the simple fact that in spite of all the bad press, potatoes are a nutritious and healthy food.